Facebook notification system will display alert to almost every activity related to your account, friends, groups you have joined, photos uploaded, comments and much more. You can view new notifications at Globe icon next to Search box at the top. These notification can overwhelm and sometimes can be irritating to the core. Fortunately, you can easily manage notifications and also disable specific type of notification related to specific friends, Facebook group and so on. 1. While logged into Facebook account, click on Globe icon between Facebook icon and Search box at the top blue bar. 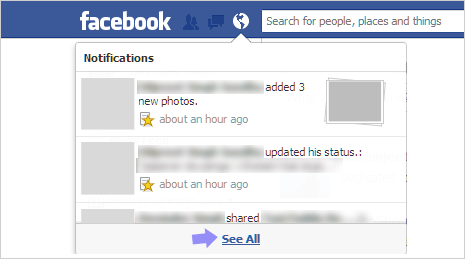 You should see drop menu showing list of latest notifications for your Facebook account. 2. Click on See All button at the bottom of this list to view all notification messages on one page. Alternatively, you can directly open facebook.com/notifications URL for the same. This page has listing of recent notifications for atleast last 7 days. 3. Hover mouse over specific notification, click X button on right side and then click on Remove button. From now on you will not receive similar type of notification. For example: If you have removed notification from specific friend, then you will not receive any notification in future for that friend’s activities. 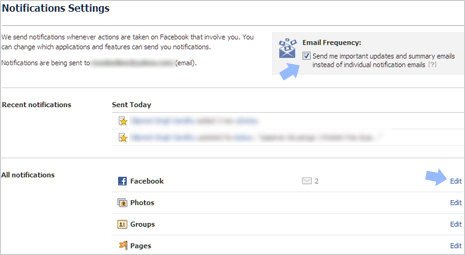 Above method is quick way to disable and stop specific type of notifications appearing while you browse Facebook website. You can also configure settings Notifications sent in the form of email messages. 1. While on Notifications page (facebook.com/notifications), click on Notification Settings link at top right part of the page. 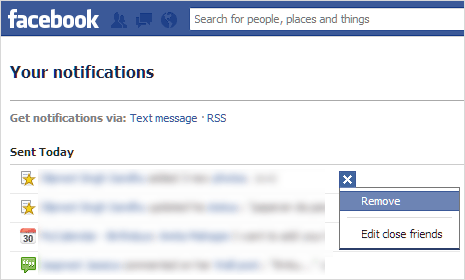 Or you can directly open Notification Settings by visiting facebook.com/settings?tab=notifications URL. 2. Top part of Notification Settings page display recent notifications. Scroll down to view “All Notifications” section. Here you can enable or disable notification alerts for specific type of activity related to individual section like photos, groups, events, notes, links, videos. For example: Under “Facebook” section you can configure notification for various activities like when someone: Sends you a message, Adds you as a friend, Confirms a friend request, Posts on your Wall, Pokes you, Has a birthday coming up (weekly message),Suggests a friend you might know, Adds a friend you suggested, Joins Facebook after your invitation, Tags you in a post, Mentions you in a comment, Subscribes to your public updates, Likes your post, Subscribes to one of your lists. Note – You cannot edit above settings, if “Email Frenquecy” [Send me important updates and summary emails instead of individual notification emails] option at top right is checked (with tick). With summary email notification enabled, you cannot customize individual notification settings.